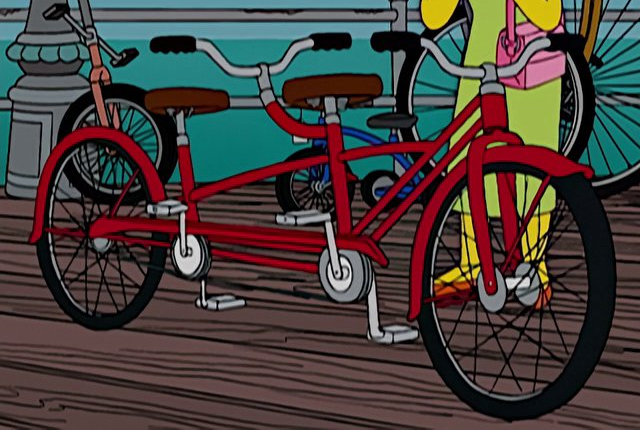 The Bicycle Built for Two is a tandem bike that Marge bought. Marge bought the bike after Homer said he would ride with her, while not paying attention to what she was saying. She was then disappointed that no one would ride it with her. Eventually, Bart feels bad for Marge and starts riding it with her. They eventually ride into Springshire and find The Leaf Garret, a tea house there. They ride back to the teahouse often. After Bart tells Marge that he no longer wants to hang out with her any more, Marge walks through town with the bike, burned the basket to keep warm and even took the bike on a bus. Marge later sold the bike to Lou, Eddie and Chief Wiggum. Lou and Eddie peddled while Chief Wiggum was in a trailer in the back. They peddled up a hill, only to go down the other side at high speeds. Modified on January 24, 2018, at 18:14.